Dominion Headquarters is a 106,00 square foot facility located in White Oaks Business Park in Bridgeport, West Virginia. We were responsible for the architectural, landscape, and interior design, as well as project management, permitting, construction documentation, and construction oversight. The building was designed to create open interior spaces that encourage employee interaction, idea sharing, and an enriching atmosphere for employees and visitors alike. 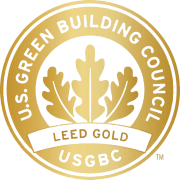 The building was designed with an energy efficient envelope and included several innovative features that allowed for the Dominion Headquarters to become the largest privately owned LEED Gold certified building in the state of West Virginia.